This blog was started as a way for me to share ideas, strategies, observations, and challenges in my attempt to create a remarkable life. I have come to realize that words have power. Words have impact. Words can change the direction of your life in an instant. 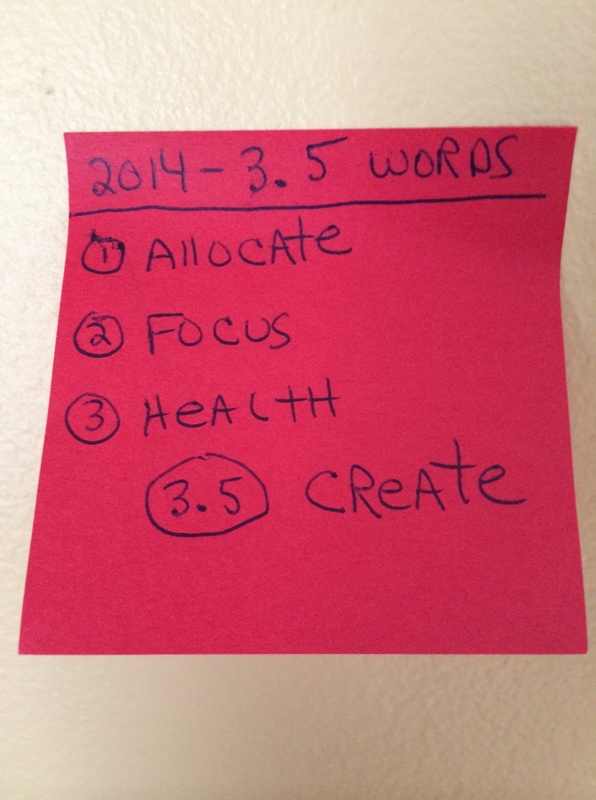 In 2013, I started the practice of beginning each year with a focus on 3 words. Right before the chaos of the holidays, I take a moment and right down 3 words that I want to define the upcoming year for me. I have found this idea to be more impactful than writing out goals or making new year’s resolutions that immediately get lost in the chaos of everyday life. I added a 0.5 word (Create) to the end of my list. Create ties the other 3 words together and “creates” synergy. Let’s call this list “The 3.5 Words to Create an Awesome 2014”. 1) Allocate: In 2014, I began dividing my days into 16 30-minute segments to be allocated to things that matter most. (16 hours of productivity. 8 hours of sleep). 2) Focus: I will focus my time and energy on the most important matters and my biggest goals. Doing my best to ignore all the noise, distractions, & time wasters that await us at every turn. 3) Health: I will continually evolve & improve how I eat, move, & sleep to give my body & mind the most energy possible. Having my body perform at its peak exponentially increases my chances of succeeding in doing what I love most: spending quality time with my young family, being actively engaged with family & awesome friends, helping my customers succeed, & getting the living hell kicked & choked out of me on the jiu jitsu mat (more on this in future posts). 3.5) Create: My goal in 2014 is to ALLOCATE my time, FOCUS my energy, and be as HEALTHy as possible. This will alow me to take full advantage of the opportunities that life offers up. My FOCUS for 2014 will be to CREATE life experiences, memories and work that matters. I will CREATE moments with my family and close friends. I will CREATE opportunities that help my customers succeed. I will CREATE the awesome photo albums and family movies that are currently trapped inside the hard drive of my Mac Book – screaming to get out. I will CREATE this blog and develope my writing skills. I will take my life, family, & career to the next level. This blog is dedicated to making these 3.5 WORDS and what they represent a reality. This entry was posted in Life and tagged 2014, allocate, create, focus, health, Joe Ciccarone, New Year, Resolutions, Seth Godin, words. Bookmark the permalink. 2 Responses to Word Up! 3 words- phenomenal, motivating and inspiring! Congratulations on writing and publishing your first blog post! Well done! I look forward to future posts and the positive impact your entries and practical/motivating content will have on my own quest for an extraordinary life.